In March 1989, a computer scientist at the Cern particle physics lab near Geneva submitted a proposal to his boss who scrawled "vague but exciting" on the document. From that idea, the world wide web was born, and on this week's Tech Tent we celebrate its 30th birthday - and examine whether it can emerge from what its creator calls a downward spiral which has seen it become a vehicle for hatred and misinformation. 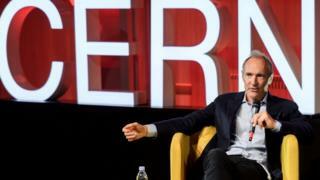 That creator is, of course, Sir Tim Berners-Lee and we travelled to Geneva to the data centre in Cern to talk to him about what drove him to create the web as well as his concerns about its current trajectory and his plan to put things right. Sir Tim took a 40-hour journey to celebrate the web's birthday and travelled from Switzerland to London's Science Museum and then on to Lagos in Nigeria. We dropped in on the Science Museum celebration to speak to three women with different perspectives on the web's history. Dame Wendy Hall, a computer scientist who has worked with Sir Tim since the early days of the web, shares many of his concerns about its current state. She admits they may have been too optimistic about human nature, but she still believes that ideas such as giving people more ownership of their data can give the web a healthier future. Marieme Jamme, the first black woman to sit on the board of the Web Foundation, and tech entrepreneur Roya Mahboob, from Afghanistan, both take a very positive view of what the web has done for them. Ms Jamme contrasts her life as a 13-year-old trafficked on to the streets of Paris before the web era with today when she is able to use the internet to combat trafficking and get information to girls. Ms Mahboob told us that using the web for the first time at 16 was like leaving "digital darkness", connecting to the rest of the world and allowing her to set off on the path to becoming an entrepreneur. And we take a journey into a very different web - the Chinese version. James Griffiths, author of The Great Firewall of China, explains how the Chinese authorities have managed to impose a very rigid system of censorship while still having a thriving web culture and some extremely powerful social media firms. The web visionaries had a utopian vision of a borderless world where information flowed freely. But China has proved that you can make the web bow to a government's demands, and other authoritarian regimes are looking at its model with great interest.